Fandango er direktør for et omreisende sirkus. Han har med seg en håndfull artister som må holde sammen for å klare seg, men det hersker en klar konflikt mellom direktøren og artistene. Den som best representerer menneskeligheten blant artistene, er den gamle klovnen Papa. Toves arbeide er satt på en hard prøve, hun er levende mål for en bueskytter som drikker, og de ansatte krever at nummeret skal avlyses. Men så dukker en ung gutt som heter Jannik opp, og blir Stand-in for Tove. Han har evner som lommetyv og imitator, og han og Tove blir forelsket. 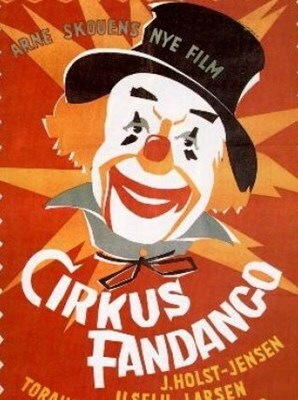 Fandango is the director of a traveling circus. In his circus are a handful of artists, who must stick together to survive; but between the director and the performers, there's an obvious case of constant conflict. The old clown Papa is the best representative of humanity among the traveling artists. Toves' skills are constantly put to the test, because she's the living target for an archer, who loves the bottle just a tad too much. Fearing for her life, the circus' other performers demand the act be put to pasture, because archery and alcohol just don't mix. But a young boy by the name of Jannik steps up and acts as Tove's stand-in. He's a master pickpocket and impersonator, but that won't stop Tove from falling in love with him. DVD-R is in Norwegian with switchable English subtitles. Approx. 84 mins. See video sample for picture and audio quality!